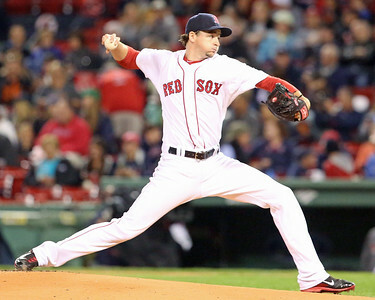 After Jake Peavy was traded to San Fransisco on July 26, Webster was called up to Boston and got his first start the next day. He got the win, allowing two runs over 5 1/3 innings, but he walked five and threw only 42 of his 86 pitches for strikes. He was not able to limit the damage in his next start, as the Yankees knocked him out of the game after he recorded only eight outs, having given up four runs while walking six. His next three starts represented a bit of a breakthrough, as he registered a quality start in each game while cutting his walk rate precipitously, but the roller coaster rolled on, and in his next three games, he went 0-2 with an ERA just south of 10.00. Scouting Report and 2015 Outlook: Listed at 6-foot-2, 190 pounds, Webster has an athletic body with a smaller frame. He has an athletic and repeatable delivery, but still struggles with his release point and with his arm lagging behind, causing him to sail pitches arm-side and up. Webster displays a four-pitch mix, featuring a fastball, slider, curveball, and changeup. He features some of the best raw stuff in the organization, but has struggled to find consistency and control of his pitches for more than brief stretches. The fastball sits at 91-94 mph and tops at 95 with quality sink. That movement has led to command and control issues for Webster through out his career. The pitch grades above-average, but plays down a tick due to that lack of command and control. His best secondary pitch is the changeup at 83-85 mph with arm-side fade. The pitch grades above-average, and he throws it with quality arm speed and confidence in any count. The slider sits 85-87 mph with two-plane break, grading average to slightly above-average. The changeup/slider combination gives Webster effective and useful offerings for both right-handed and left-handed hitters. He will also flash a fringe-average curveball at 76-79 mph. The pitch has depth, and but lacks bite. I have seen Webster wait until the second or third time through the order to begin incorporating the curveball to keep hitters guessing and off-balance with another offering.